Nick Jonas and Priyanka Chopra took part in a traditional Hindu wedding ceremony at the Taj Umaid Bhawan Palace in Jodhpur in the actress' native India on Sunday, E! News has learned, a day after they exchanged vows there and officially became husband and wife at a Western, Christian wedding. The couple's Hindu wedding took place on the palace grounds, with Mehrangarh Fort as the backdrop. The event featured a four-pillar wedding mandap, or canopy, adorned with flowers. Priyanka wore a stunning Sabyasachi ensemble, according to India's Times News Network. The Jonas family members in attendance included Nick's parents Denise Jonas and Kevin Jonas Sr., a pastor who officiated the couple's Christian wedding, and his brothers Kevin Jonas, accompanied by wife Danielle Jonas, Joe Jonas and his fiancée Sophie Turner, and Frankie Jonas. A source told E! News that the bride looked "breathtaking in her traditional red Indian wedding outfit." The insider added, "Nick did a beautiful job following the customs of a Hindu ceremony, it was lovely seeing how they honored both of their heritages." Traditional Hindu ceremonies feature several rituals. As per tradition, Nick arrived on a ghodi, or horse, and the newlyweds left on the back of an elephant. According to the Times News Network, they then took part in the varmala or garland exchange ceremony. Later in the evening, the bride and groom and their guests had an elaborate dinner, and an after-party was set to take place around midnight, the outlet said. On Sunday, Nick posted a photo of himself alongside his three brothers and captioned it "Family." Hours before the Hindu wedding, the bride took part in a haldi ritual, in which haldi paste is applied to ward off the evil eye and bring good fortune, a chooda ceremony, in which she is gifted 21 bangles from family members, and a safa ceremony. The color scheme was pink, orange and purple, and the decor included marigolds, according to the Times News Network. 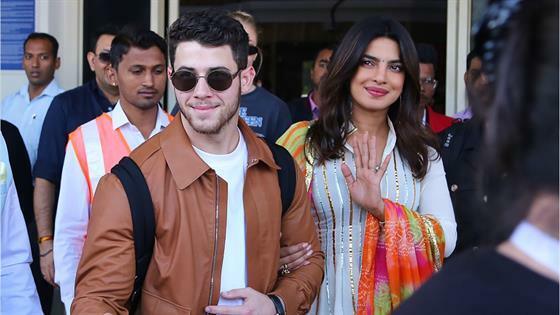 Nick, 26, and Priyanka, 36, went public with their relationship several months ago following more than a year of rumors and announced their engagement in July. Jonas has been to India before, as have his parents, who joined the couple at engagement festivities in the country in August. Earlier this week, their families got together in India for traditional pre-wedding festivities, including a puja ceremony, a Mehendi ceremony, and a Sangreet dance contest. "People will need vacations after this wedding," Priyanka joked to Vogue. Check out other photos from their wedding weekend below. Chopra's beautiful band comes from the Haute Joaillerie Collection and features 3.90-carats of ashoka-cut diamonds with an east/west setting in platinum. As for Jonas' hardware, his ring is an 18k ethically sourced yellow gold band. Jonas' brother and future sister-in-law look stunning in a dapper suit and blush ensemble. Chopra dazzles in her champagne-colored, beaded ensemble with her new hubby by her side. The actress and the singer grace the cover of People and give fans the first sneak peek of the wedding photos. How gorgeous is her Ralph Lauren gown? These two look positively radiant as they make their first public appearance as husband and wife. Just look at how Jonas lovingly stares into his wife's eyes. The couple celebrate their pre-wedding Sangeet with Western and Bollywood dances with their loved ones. Nick showcases his Bollywood dancing skills. Priyanka dances with her mom Madhu Chopra, at the Sangeet party. Nick and Priyanka appear onstage at their Sangeet party, held before they were wed.
Sophie Turner dances onstage at the Sangeet party. So much joy at at the Sangeet party! Kevin Jonas, Joe Jonas and Frankie Jonas join their brother. The guests are all smiles at the Sangeet pre-wedding celebration. Priyanka and Nick celebrate with their guests at their Mehendi ceremony. The actress twirls in her colorful Abu Jani Sandeep Khosla Couture dress. The bride cheers with her female guests and wedding party members, including future sister-in-law Sophie Turner, who is engaged to Nick's brother Joe Jonas, and cousin Parineeti Chopra, who wrote on Instagram, "THE MEHNDI. The job of us bridesmaids was to make sure the bride was happy and comfortable at all times. But we didn't have to worry about it - coz Nick promised to do it all his life. Welcome to the family Nick jiju!! Im so so happy that the Jonas and Chopra family are now united!!!" Male guests hoist the groom-to-be up in celebration. Guests crowd around the bride and groom. Nick takes part in a cricket game as the women gather for the Mehendi ceremony.